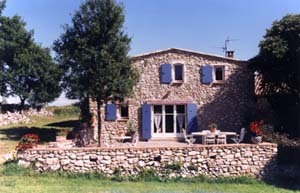 In the Dizier Hamlet, the gîte called "le Grand Pré" offers plenty of space and nature. Its lavenderblue shutters open on a 35 square meter shady terrace facing south-east, overlooking a vast meadow that slopes down to the forest. This 140 square meter gîte can house 8 people. The dining/sitting room with its jointed stone or pastel coloured walls, opens into the terrace through a large bay-window. The clear functional kitchen is fully equipped with refrigerator, dishwasher, cooker with oven and hood. The ground floor also includes a room with a double bed, a washstand and shower, and a separate toilet where a washing-machine is installed. On the first floor another separate toilet and three bedrooms; one which has a double bed, washstand and shower, the two other room sharing a shower-room and four single beds. A fire-place, electric heating, telephone and television are also available. Wifi included.